You might think tubes would make an obvious package for toothpaste, but the first toothpaste in a tube wasn’t sold till 1892. These kind of containers had been around for 50 years, but were only used for storing oil paints. Most folks associated collapsible tubes with “Burnt Umber” or “Cadmium Yellow.” Hardly the sort of thing you applied to your teeth. 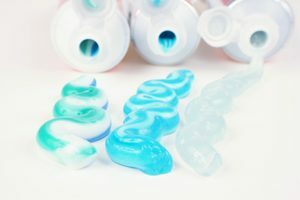 Up until then, toothpaste was packaged in expensive porcelain jars that only the rich could afford—making it virtually impossible for lower classes to clean their teeth with toothpaste. Putting toothpaste in paint tubes suddenly made toothpaste both convenient and universally affordable. It was an early milestone in dental health, and one of the greatest advances in product packaging ever devised!